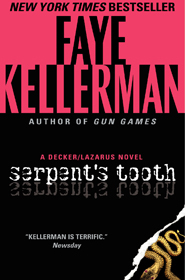 SERPENT’S TOOTH is the ninth novel feature Decker and Rina. It explores one of my favorite themes, family pathology. When an elegant restaurant is shot up by unknown assailants, Decker must not only find out who did such a heinous crime, but the reasons behind it. Unable to get to his prime suspect, Decker enlists a little help from his friends.